The basic premise of all former productions including the film is; a wonderfully talented woman (Daisy/Melinda) with low self-esteem seeks out a psychiatrist to assist her in quitting smoking. Through clinical hypnosis sessions, her past life (in the 19th century) is revealed. After a few sessions, the psychiatrist falls in love with the recovered memory. With music by Burton Lane, and book and lyrics by Alan Jay Lerner, it was a kicky addition to the 1960s musical genre. The songs aren’t terribly memorable (save for the title song) but there is a certain charm about the show. Today, with approximately 20 producers (including Mr. Lerner’s daughter) and a new book by Peter Parnell, the show is almost unrecognizable. The character of Daisy, is now a gay man (David Turner) when awake in present day. The time period (of present day) is now 1974 and the flashbacks are 1943. Mr. Turner’s character, David, has none of the charm and talents of the original character Daisy. He is a milquetoast slight child/man who is hesitant to move in with his boyfriend on their one-year anniversary. The boyfriend, Warren (Drew Gehling) makes many musical and non-musical references to their one day getting married. Because that is what homosexual men in 1974 evidently talked about. Changing the gender and sexual orientation of the lead serves no purpose except self-indulgent ones (whatever they may be.) It adds nothing to the story, if anything it takes away any believability and creates awkward moments. Is my world view to be challenged by accepting it is not offensive to suggest a homosexual man is no more than a repressed woman inside? And while we’re at it, am I not to be offended by a (presumably) all white cast? The biggest of all the crimes of this “re-conception” is that it diminishes Jessie Mueller’s role to that of a walk-on. Her voice and demeanor are reminiscent of a young Liza Minnelli. She is funny and poignant, has incredible stage presence and possesses a voice that is not to be believed. She stopped the show with her number Ev’ry Night At Seven. That second act number and a ballroom dance number (in Act I with David, Melinda and Dr.Bruckner) are the true gems of the show. Directed and “re-conceived” by Michael Mayer, the show has very little dancing, which really is just as well, as the ensemble includes not one dancer. The two requisite chorus song and dance numbers are dull and give the impression of fulfilling a requisite. But the ballroom dance number (Joann M. Hunter, choreographer) is wonderfully conceived and executed. The set (Christine Jones) is simple and streamlined and a bit noisy. The costumes (Catherine Zuber) are somewhat schizophrenic. The 1943 costumes are simply lovely, they are appropriately costume-y, to portray a waitress, band singer, etc. The 1974 ensemble of the show is dressed as H.R. Puffentstuff extras. They are color coordinated cartoon-y interpretations of how students (in their 30s) dressed. Mr. Connick is dressed in a 2011 suit and tie. His long suffering colleague Sharone (the lovely Kerry O’Malley) is dressed for a Cosmopolitan photo layout. She has more costume changes than anyone else, and each wrap dress is stunning. There is nothing about her character to suggest she is a fashionista, but I enjoyed the clothes. 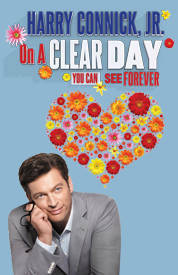 Clumsy, self-serving revisions aside, it can not go without mention, that a director needs to work very very hard to strip Harry Connick Jr. of all charm and humor. Granted, Dr. Bruckner is not the most scintillating character ever conceived, but in this production he is on thorazine. Luckily, Dr. Bruckner has many songs, and oh to listen to Harry Connick Jr. sing from just a few feet away! But if you have ever seen Mr. Connick Jr. live, even having just a casual conversation, you will not recognize him in this fugue state. Meanwhile, much exuberance and stage time is given to the character of Muriel (Sarah Stiles,) David’s roommate. She is a non- traditionally attractive quasi ethnic looking friend to all gay men (get it?) I’m sure she’s a talented woman, but this role is a caricature and employs one of those novelty voices that I don’t enjoy (think Kristin Chenoweth as a muppet.) Giving this character more stage time than Jessie Mueller, is a poor but fixable choice. And some fixing they will do. I saw this production one week into previews and on the night the second act was entirely re-worked (and ran 20 minutes over.) Removing the misguided attempts at laugh lines (Cher and Barbra Streisand cringe inducing “jokes”) is an easy cut. There is time to fix the sound and give Harry Connick Jr. more to work with, but the re-conceived conceit is not going anywhere. I am not a stolid traditionalist, I like new things. I loved Mr. Mayer’s Spring Awakening. But I am not a fan of changing something just to say it’s new. I am not buying that something is improved just because it’s changed either. And I will never ever support squandering talent. Ms. Mueller deserves a better debut and Mr. Connick Jr. deserves a better role.